The Apicomplexa are responsible for many diseases of humans and other mammals and have huge impact on health and economy. It is important to understand metabolism and host-parasite relationships in order to develop drugs and vaccines for these infections. In the past few years, a number of apicomplexan genomes have been sequenced. The prediction of gene models and annotation of functions is still challenging and an approach called ‘metabolic reconstruction’ was established, where proteins are assigned to functions within metabolic pathways either by a slow manual or faster automated approach. 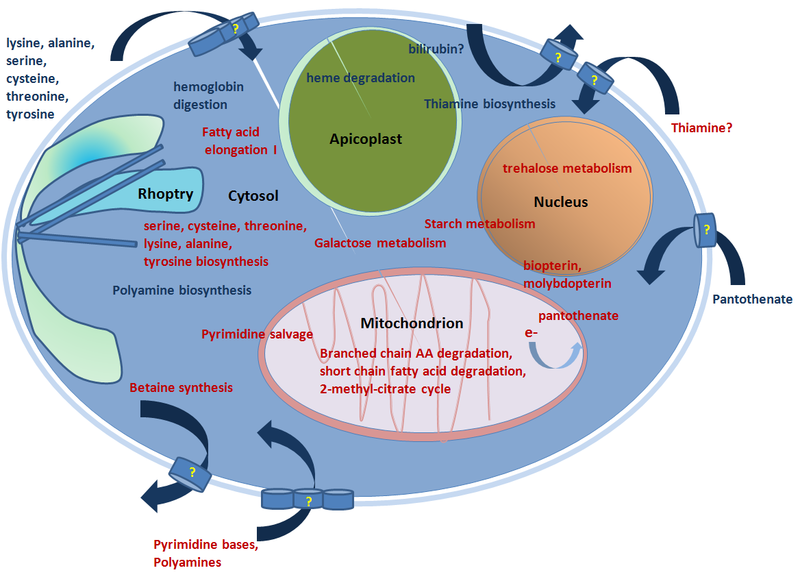 Compared to the automatic metabolic reconstructions for Plasmodium falciparum, the manually reconstructed pathway database Malaria Parasite Metabolic Pathways (MPMP) proved to be of very high quality. There are no manually reconstructed resources available for other apicomplexans including, Toxoplasma gondii, the model Apicomplexa. The automatically annotated pathways for T. gondii have large number of pathway holes and some of the pathways are nonspecific to Toxoplasma. This web database provides the core metabolic pathways for other apicomplexan groups available in EupathDB such as T. gondii, Neospora caninum, Cryptosporidium muris, Cryptosporidium parvum, Cryptosporidium hominis, Babesia bovis, Theileria parva and Theileria annulata. The metabolic pathways in this resource were constructed in semi-automatic manner using MPMP and KEGG pathways as templates. The metabolic pathways were reconstructed using genome annotations in EupathDB, sequence homology and the presence of protein functional domains. Any available biochemical/physiological evidence were added to this website. The metabolic reconstructions of this website are linked out from respective gene pages in the latest release of ToxoDB. Figure 1 - Comparison of metabolic capabilities of Plasmodium falciparum and Toxoplasma gondii. The metabolic capabilities present in T. gondii and absent in P. falciparum are shown in red colour and the capabilities present in P. falciparum and absent in T. gondii are in blue.